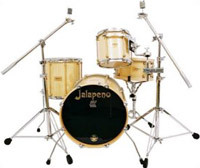 In a world full of mass-produced drums, Jalapeno Drums stand out as a shining jewel, offering the customer complete customization combined with hand-made individuality. Now in it’s tenth year of trading, each and every drum is still lovingly hand-crafted, to order, by drummer / craftsman David Nuttall: an Englishman who is as passionate about building drums as you are about playing them! More response, more resonance, more tone, more volume. Complete customization to customer specifications. Vertical grain construction for increased response and sensitivity. Exclusive design solid brass lugs. 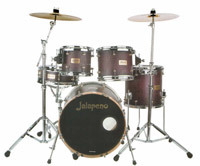 Choices of snare drums, drum kits / drum sets, toms, bass drums, frame drums, orchestral drums, marching drums & shells. Easy ordering: all major credit / debit cards are accepted, and international shipping is available.